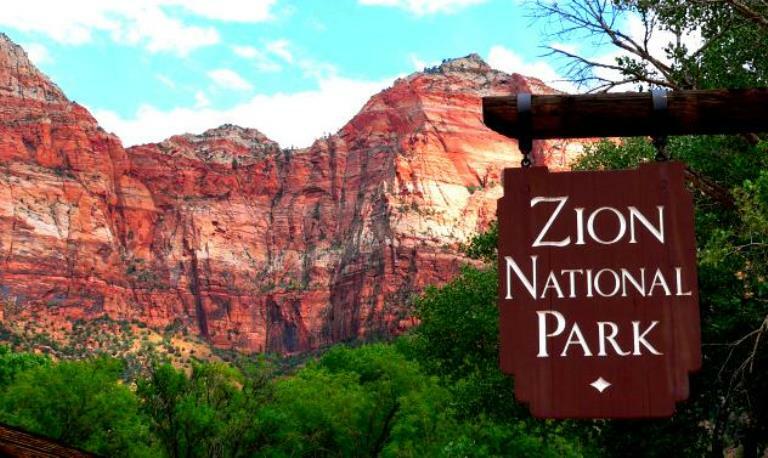 A park full of spectacular scenary and features: the huge sheer-walled red-and-pink main Zion canyon; “slot” canyons, gorges, towers and spires. Note: Negs: Popularity; crowding on the best trails. 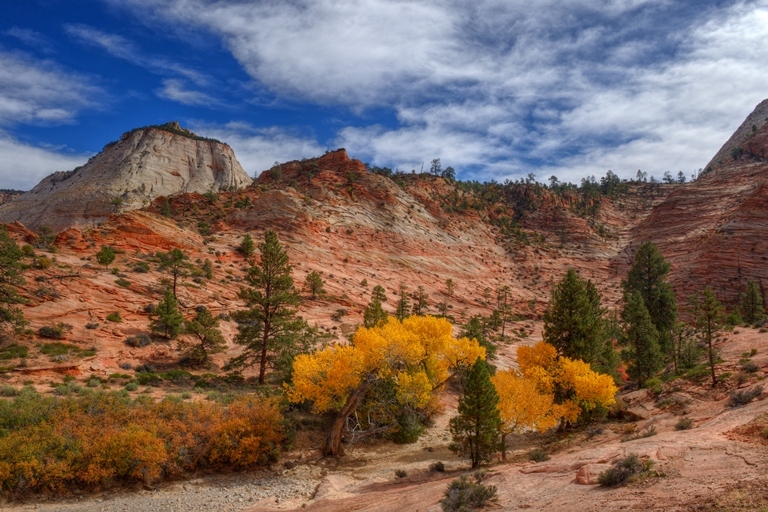 Zion has some of the world’s finest desert-canyon landscapes. Millions of years of erosion of these deep sandstone lands has produced extraordinary scenery of vast, sheer-sided, colourful canyons and an astonishing selection of towers, spires, cliffs and slot canyons cut into high, forested plateau. There is a huge array of splendid and varied walks here, from short canyon-bottom strolls to demanding climbs to remarkable viewpoints, to famous slot canyons, to multi-day yomps. Angel’s Landing: this outstanding 1,500 ft climb up a huge and absurdly narrow spine (“only an angel could land on it”) at the heart of the park is justly famous. 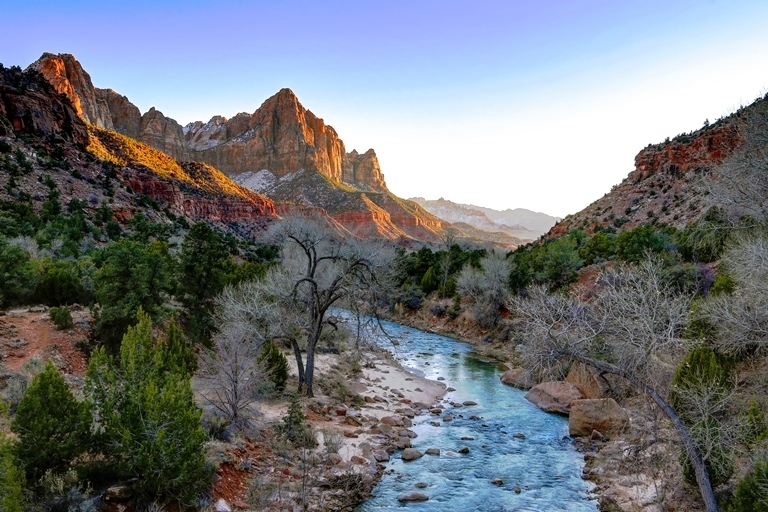 Marvel at superb and gripping all-round views of the deep Zion canyon and its spires, towers and red sandstone walls. 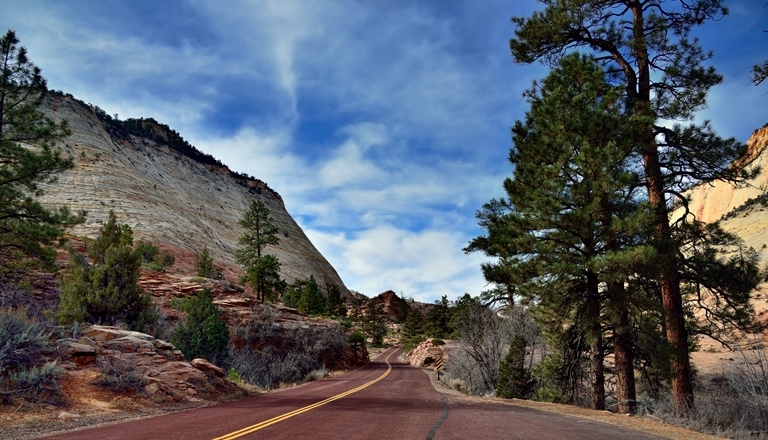 The 1,000 ft climb to Scout Point, the turn-off to the Angel’s landing spine, is steep but straightforward. Thereafter it is a thrilling clamber up the spine on a steep and narrow path, often teetering, horribly exposed, over huge drops, with many cable-assisted stretches: don’t try this bit if you are uncomfortable with heights. 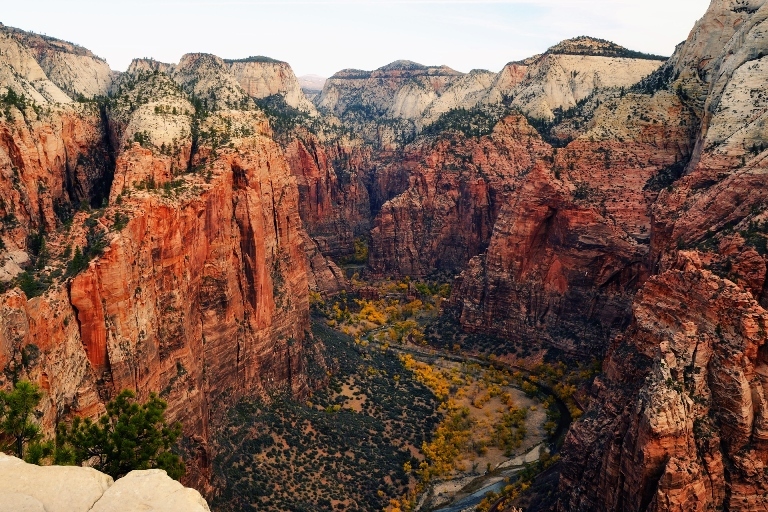 Observation Point and Hidden Canyon: Observation Point is enthroned, at 1,984m (6,508ft), on the eastern rim of the main Zion canyon, more than 2,000ft above a major bend in the canyon, directly across from the for once diminutive-looking Angel’s Landing. The 4-5hr, 12km (7.5 miles) round trip is stunningly good. From the Zion floor, you can’t see how the trail could get up above the sheer walls, but it is superbly constructed and does just that in a series of switchbacks. 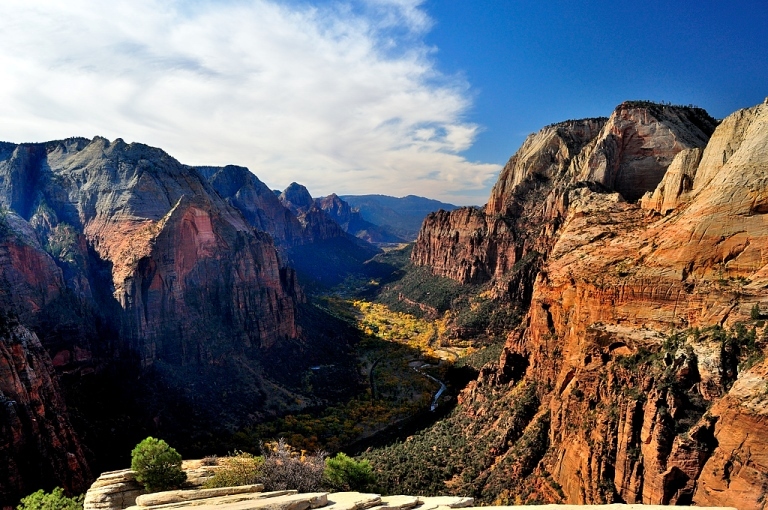 You emerge into a magnificent upper bowl, from which a long series of switchbacks and a balcony walk to Observation Point gets you to a series of ever-better views as the whole of inner Zion appears below you. Wonderful. If you can, take in the one hour round walk, itself a marvel chiseled into sheer walls and slickrock, to admire the extraordinary narrow, sheer-side Hidden Canyon. The Emerald Pools Loop: a series of.. er... green pools and waterfalls up a short, steep side-valley below the main canyon’s huge, sheer western wall. The pools and valley are gorgeous; stunning views of some of the area’s most famous formations. 3miles return, a moderate walk. Very popular! You can walk to the lower pool in a bit over 2 easy kilometres. The Watchman: a steep slog up a side canyon onto the eastern highlands and out to a fine viewpoint (at just under 2,000m) near the southern park entrance. 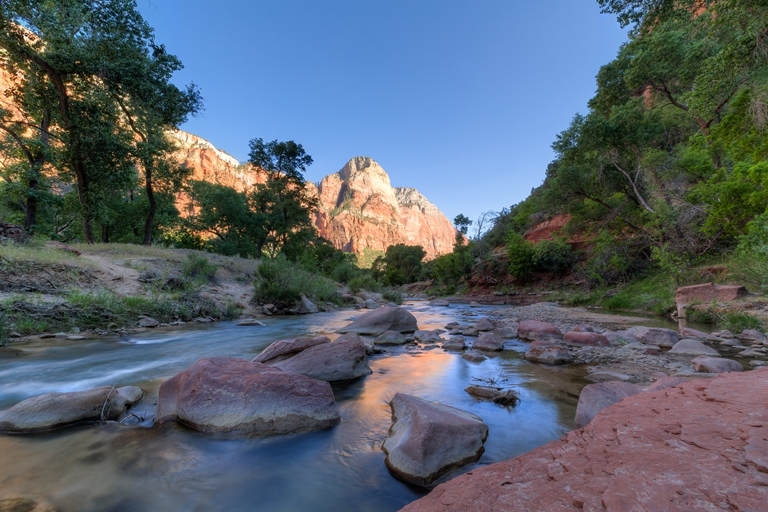 Estimates of length vary; the Day Hikes of Zion NP map says 3.3miles/5.4km. 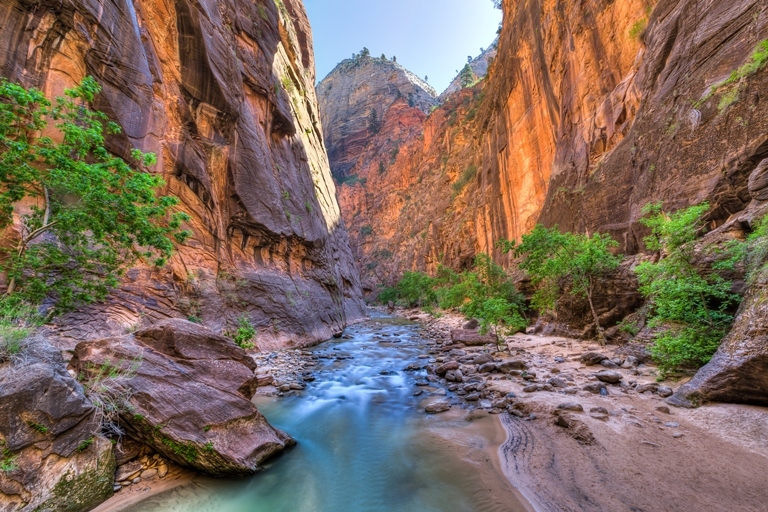 Zion Narrows: this extraordinary deep, narrow “slot” canyon is the best-known, and arguably the best, of its kind in the world. Water-smoothed red sandstone walls soar above, over 1,000m high in places. The canyon is some 26km long, from the trailhead at Chamberlain’s Ranch to the north-east to the exit into the main Zion canyon. It can be walked in a long day (or with an overnight); but most people walk in from the bottom of the Narrows, whether on the easy, maintained Riverside Walk or, more adventurously, on the longer “Bottom Up Route”. 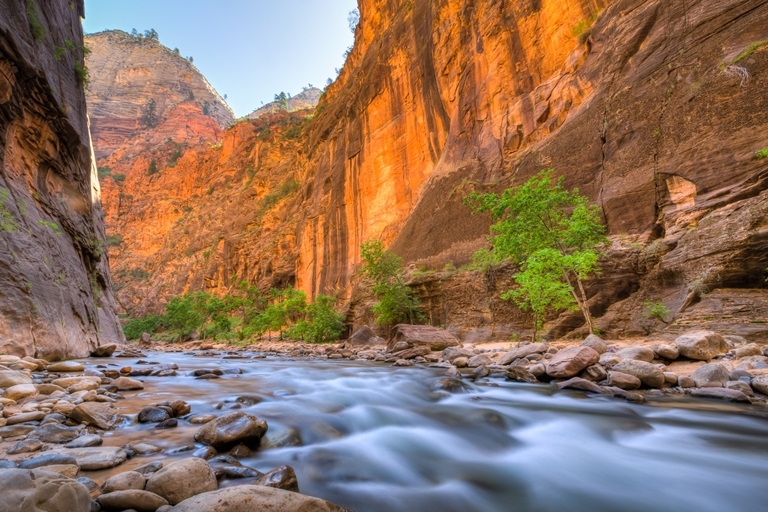 The Virgin River is a permanent feature, so, once you are past the Riverside Walk, you are paddling/wading (sometimes waist or even chest deep) the majority of the time. The Top Down Route is the big ‘un, a tough but thrilling and fascinating hike the entire length of the Narrows. One very long day, or two with an overnight camping in the Narrows. The Bottom Up Route is demanding and tiring walking, much of the time in the river after the end of the Riverside Walk. But an extraordinary experience. 15km/9.4 miles return. Beyond Orderville Canyon is Wall Street, 3km+ of exceptionally narrow and high walls, the defining section of he Narrows. The Riverside Walk: is an easy, dry, maintained 2.1 mile (3.3km) return trail which meanders beside the river up to where the walls have narrowed such that the river occupies the whole floor. A stunning walk, but a mere foretaste for the wonders of the longer trails. Beyond here, you will be walking in water much of the time; come prepared for wet and variable canyon conditions – and for getting really cold. You can hire water boots and sticks in Springdale. Flash floods are a menace: take careful precautions before you go. 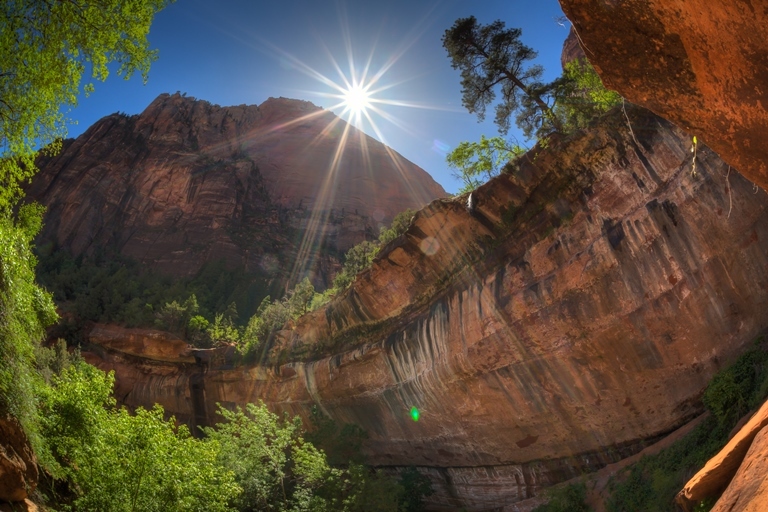 Mystery Canyon: this deep and beautiful hanging canyon feeds into Zion Narrows; it is a canyoneer, and one of the finest in Zion and probably in the USA. Expect a steep and demanding entrance, numerous rappels, some of them major, in gorgeous dark sculpted narrows, an enormous landslide/rockfall obstacle. The grand finale is the rappel down Mystery Falls into the mottom reaches of Zion Narrows. The West Rim Trail is a long, but fascinating, beautiful and dramatic walk. Starting near Lava Point in the far north of the main park area, it winds along the high plateau west of the main Zion canyon areas, with superb views west across the dramatic Wildcat Canyon, then drops on amazing dynamited paths across the cliffs and slickrock of the Zion canyon sides to Scout Lookout, then down endless switchbacks into the narrow Refrigerator Canyon and down to the Zion canyon-bottom at The Grotto. It would be negligent not to take in a climb of Angel’s Landing while you are at it. Wildcat Canyon: a superb 9.3km, 3hr tramp across the grass and forest lands of the plateau and the rocky slopes above this magnificent canyon between the main Zion area and Kolob to the north-west. You should make the 2+mile side-trip to the Northgate Peaks for exceptional southward views. The Connector Trail connects the Hop Valley Trail into the Kolob Canyons area from the Kolob Terrace road in the north-west, with the Wildcat Canyon Trail. A fine walk in its own right. From the bottom up: a strenuous round-trip. You don’t see as much of the amazing sections as from the top-down, but this is a hike not canyoneering, and still a fine and fascinating walk by any standards. From the top down: a strenuous and demanding hike/canyoneer. You will also need to swim through several deep, cold, clogged pools. Permits are required for both routes. In the far south-west, the Chinle Trail makes an interesting journey out into desert scenery, to admire a petrified forest, among other delights. 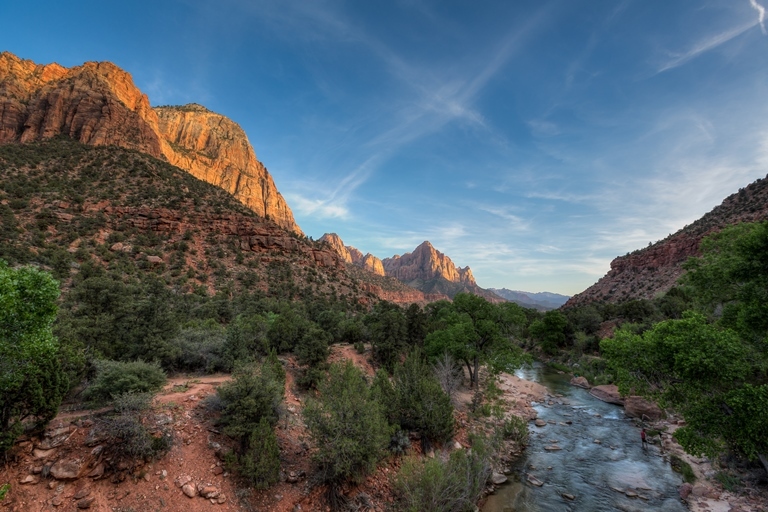 The East Rim Trail is a fine walk-in to the heart of Zion from the east entrance to the park. It spends much of its time on the eastern highlands before dropping into the huge bowl to the east of Observation Point. Thence it descends to the base of Zion at Weeping Rock.16km, 4hrs one way. A shorter there-and-back along the beginning of the trail takes you along the trail to the contorted Jolley Gulch slot canyon. The East Rim Summits Trail is a major undertaking, 43km/27 miles along the East Rim Trail in from the eastern entrance to the park to the eastern rim of the main Zion canyon and eventually down through Echo Canyon to the canyon floor, but detouring to take in all 3 main walking summits: Deertrap Mountain, Cable Mountain and Observation Point – or one or two of them, as your energy dictates. The East Mesa Trail is a superb walk-in from the east across the high ground to Observation Point, one of the finest of all the park’s viewpoints. 4km, 1hr one way. You can then walk on down to the main Zion canyon. The Kolob Canyons area to the north-west of main Zion is itself gorgeous and fascinating, but much less visited. Two days at Zion won’t be long enough for most walkers to get out here, but if you have three or more, you should take time up here away from the crowds in the heart of the park. 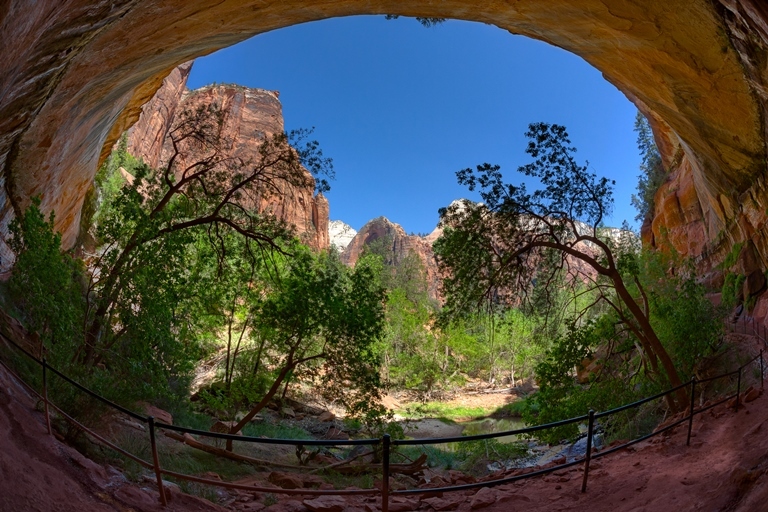 La Verkin Creek Trail: a 22km there-and-back to the foot of the climb to see the huge Kolob Arch, arguably the world’s longest free-standing arch, and the junction with the Hop Valley Trail and the Willis Creek Trail. 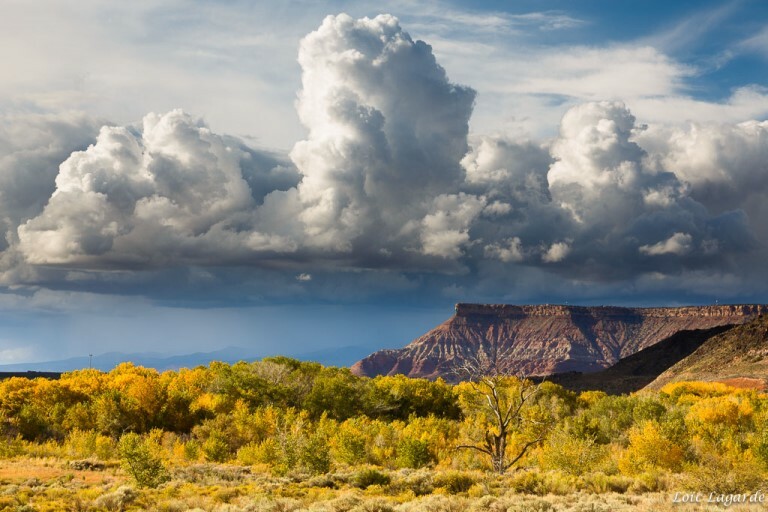 You can walk back out, or take these trails for onward backpacking: Lovely Hop Valley takes you south to the Kolob Terrace Road and the Connector Trail to the West Rim Trail and the heart of the park. Walkopedia walked here as part of a Zion, Bryce, Goblin, Capitol Reef, Arches NP, Canyonlands, Monument Valley, Grand Canyon loop. We had 1.5 days at Zion, so walked Observation Point on the first half day (we wanted to whizz up to Hidden Canyon en route, but ran out of daylight). On day 2, over-optimism hit, and we walked the brilliant West Rim Trail, which comes down right by the Angel’s Landing ridge, so we planned to take that in en route. But we were too leisurely about the West Rim Trail, stopping to enjoy its delights too often, and got to Scout lookout just after 5pm, when, in November, twilight was already there. We walked a bit of the Landing, but had to turn back because the light was seriously fading. We hardly dare admit, as it deserves ridicule, we’d hoped to explore a bit of the Narrows too, indeed hired and lugged water-boots 15 miles for that purpose. This can be tough walking in remote mountains with uncertain weather. Come fully prepared, including carrying enough water. 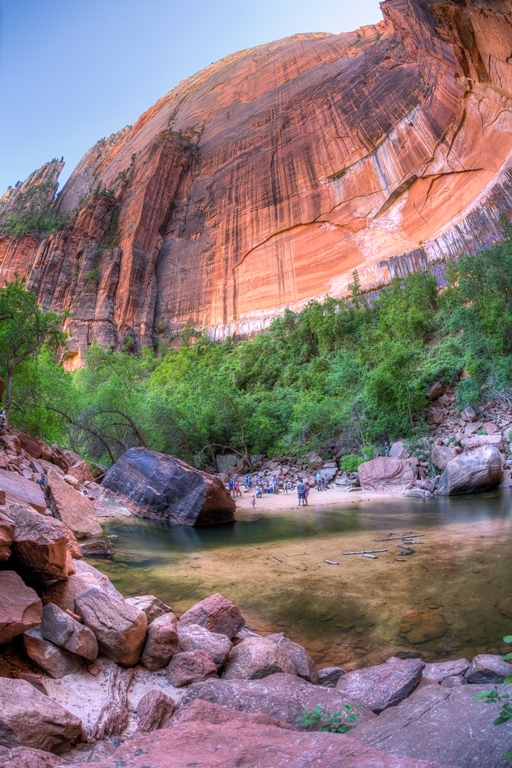 Zion is heavily visited, so you won’t be alone on its better-known trails. Quite a lot of concreting of the main trails is inevitable, and a bit depressing to the purist. Have a look at TripAdvisor – there are tens of millions of reviews, so you may get good, current views on guides, places to hike and places to stay on the Galapagos. Our friends and partners Responsible Travel have a selection of walking and other holidays in South-west USA. You should get good ideas, perhaps for something you hadn’t thought of!